Measurement is a process that students use everyday as they explore their home and school environment. They wonder about how far they can run, how long it will take, the distance from their house to school, who is the tallest in the class, how big is the playground, how many cups of juice are left in the container in the refrigerator, who has more ice cream on their ice cream cone, etc. To answer these kinds of questions, students need to use the concepts and tools of measurement in order to collect the necessary data to make sense of their world. Measurement also helps students connect ideas in other areas of mathematics such as number and geometry. In this unit on measurement, students are actively engaged in the measurement process. They begin as explorers in search of the Abominable Snowman, the Yeti. They come back to their “lab” and connect their experiences to their own personal worlds. 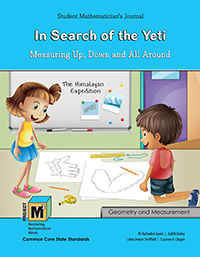 As mathematicians, they measure objects in their classrooms, at home, and even their own bodies in an attempt to recreate a likeness of the Abominable Snowman. They make estimates, develop personal benchmarks, and focus on accuracy and precision of measurement. They examine irregular shapes and develop strategies to find the area. In the early primary grades, students have many experiences using nonstandard units of measure such as lima beans, straws, and paper clips to measure. This unit introduces standard units of measure and the need to select units appropriate to the attribute being measured. As students explore the attributes of length, area, and liquid volume, students are immersed in problem solving situations that require them to use a variety of other mathematical concepts and skills from number and from geometry.